Harvest is in full swing here at Claiborne & Churchill! This week, we tracked down Coby in the cellar and asked him all our winemaking questions about Harvest 2015. Harvest seems to be firing on all cylinders! How much have we picked so far? As of this week, we are 95% done with picking everything. Pinot Gris from Laetitia came in yesterday. We also got Merlot from Vintage Cowboy, which will go into the Port. Last week, we finished picking Gewürztraminer, Estate Riesling, Riesling from Talley, and Pinot Noir from Wolff. We picked some Pinot Noir early for Rosé, too, to keep that low alcohol and good acidity. Everything is looking really good so far. This year, we got Pinot Noir and Chardonnay from across the street at Greengate Ranch & Vineyard. That’s the first time we’ve gotten fruit from them, and we’re stoked about that. Also, recently Twin Creeks Vineyard was granted Estate status, which is really exciting. Now we can make Estate Pinot Noir using Twin Creeks fruit. Any cool new winemaking gadgets you are using this year? We have a new CO2 sprayer. It’s this tank that sprays carbon dioxide snow. It’s really fun to use. We add CO2 before and after fermentation. It’s a heavier gas, so it weighs down on top of the fruit to prevent it from touching oxygen. Why don’t you want oxygen touching the wine? Oxygen touches the fruit and juice throughout the winemaking process. It alters the color and flavor of the wine, and has the effect of aging it. We try to minimize that wherever possible. This CO2 helps us keep the wine from oxidizing. Can you walk us through that process? After the fruit comes in, we process it, and then we put it into three-quarter or one-and-a-half ton fermenters. Then, we spray CO2 on top, or we can gas a whole tank with CO2 before we put the fruit in. In those cases, we fill the tank with carbon dioxide so it’s filled with heavy gas. Then when the fruit goes into the tank, it hits CO2 instead of oxygen. That is really important in preserving the quality of the wine. We’ve heard you can use CO2 spray, or use dry ice instead. Is that true? Yes, but dry ice chills the fruit down. If you add enough of it, it will actually lower the temperature of the must. Even though the CO2 is cold, it won’t have the same chilling effect on the fruit. Dry ice is really good, but it’s expensive. Instead of using dry ice, we pick our fruit early in the morning or late at night. When the fruit comes in, it’s already really cold, so we don’t really need to make it colder. Doesn’t wine release it’s own carbon-dioxide during fermentation? Yes. For example, when we are doing punchdowns, manually pushing down the cap of the wine, CO2 will come up. But as fermentation goes on, that slows down. Toward the end, very little CO2 is being made naturally. That’s where it can become a problem. When oxygen reaches the wine at that point, it can create volatile acidity and other issues. You spray the C02 over the bin, and it’s like a blanket. It keeps the wine safe. 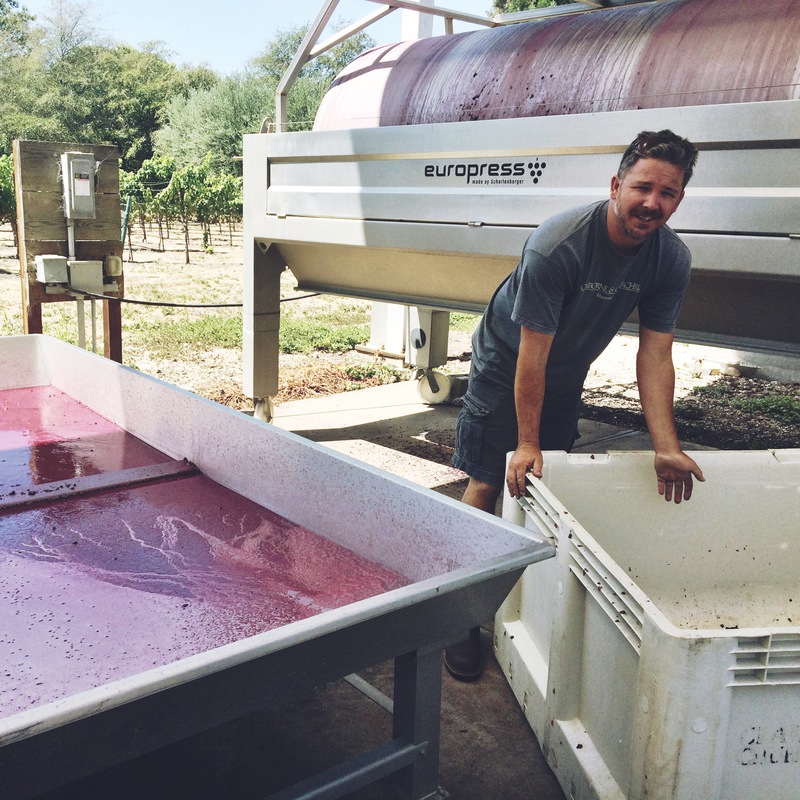 Have any winemaking or harvest questions for our winemaker? Comment below, and we’ll choose a few questions to answer in later posts!